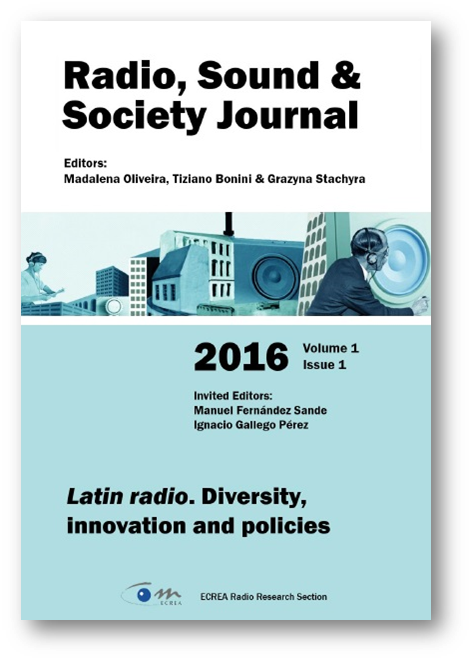 The Radio, Sound & Society journal is an open access scientific journal edited by the ECREA Radio Research Section. It is a semiannual publication, aimed at publishing relevant research (fundamental and applied research outputs) in the field of radio and sound. The journal welcomes contributions regarding challenges radio faces in the web environment, acoustic language, audio media in general and sound art. Areas of interest include radio history, radio business model, technology, narratives and programming, audiences, advertising, music industry, web radio, sound art, public service broadcasting, aesthetics and sound, sound and literacy. Listen, Watch, Share. The role of listening in a screen-based mediascape. A study commissioned by Nokia in 2013 discovered that people check and touch their smartphones an average of 150 times during a waking day of 16 hours, but according to 2016 Facebook data, 85% of Facebook video is watched without sound. How much radio and sound are involved in our daily use of mobile communication technologies? We may watch videos on our mobile screens without sound, but we still engage with contents generated by radio stations, through sharing videos of radio shows on Twitter or posting or liking a comment on the official fanpage of a radio station. In 2013 Ben Cooper, the controller of BBC One Radio, inaugurated a new strategy: “Listen, Watch, Share”, asserting that “Engaging with radio content is more valuable for us than being exposed to our content” (2013). Attention toward radio content is no longer only aural or visual: people touch the screen to open an app like TuneIn, Stitcher, Spreaker, SoundCloud, Mixcloud, or the proprietary app of a single radio channel (like NPR One) in order to listen live or on demand to their favourite radio programme. Listeners touch the screen to watch a YouTube video of their favourite music band being interviewed in the studios of BBC One, as planned by Ben Cooper; touch the screen to go on Facebook or Twitter and share, comment, mention or like (all tactile actions) content produced by their favourite radio or host; touch the screen to open an app like Shazam to find out what song is being broadcast on the radio. The ways to connect and relate to radio content imply an aspect that is more and more tactile, as well as being auditory and visual. This rise in the tactile activity of the networked publics of radio produces a change in the methods of valuation of radio. If classic radio listening can only be measured through traditional survey methods (portable people meters, diaries, phone call-based surveys), listeners’ interaction with these screens produces a different type of data: every time we touch the screen to open an app, leave a comment, like, Retweet, press play or pause, download a podcast, or share a video, each of these single actions is tracked and archived in order to be analysed, so we are able to calculate not just the time spent listening to a brand, but the time spent interacting with the content of that brand. Our tactile actions provide broadcasters with a new mass of data to manage, in order to refine the mechanism of audience behaviour prediction underlying the commodification of broadcasting that has been in use since the beginning of commercial broadcasting in the early 1920s. What is the role of sound-based content in our daily routine of media consumption? Is sound, and more in general, the aural experience mediated by ICT more threatened than ever? Aware of the necessity to recentre some attention on the aural experience in a digital screen-based mediascape, Radio, Sound & Society Journalwelcomes proposals focused not only on radio but more widely on sound-based media content and consumption. The journal invites researchers to submit proposals discussing how sound may still shape the interpretation of social and cultural life. Thus, themes and topics that might be covered include: audience studies; political economy of digital radio; radio and digital culture; podcasting and dissemination; sound aesthetics; algorithmic radio; automated content curation and communication in digital and social media; human content curation vs. automated content curation; networked listeners; digital Methods applied to social media; changing listening practices; community radio and digital culture; innovation in Public Service Media; web and mobile platform content; digitisation; research methodologies; social networking and user-generated radio; sound art. Instructions for submission: Click here and scroll down to check information on citing references; journal sections; editorial procedure; author guidelines; and how to register and submit.